MTNL is on a marketing spree, with ads of this public operator being seen wherever your eyes move. Yes it’s true, MTNL has managed to cover all possible media and is aggressively trying to publicise the new offers being launched by them. Just happened to tune into a radio station and what do we hear? Those who are calling at Re.1 are crying over their call charges and the voice over artist is enjoying tension free calls at 90Paise. This is definitely the English version of the ad, which is trying to compete with the other operators call charges being reduced to Re.1. The operators we are talking about are Airtel and Vodafone. This is definitely a strong move my MTNL and is urging other private players to get into a war of the cheapest, which mostly will follow in the coming months. We guess the sleeping tiger has now awakened and is hungry, that’s for sure. Sarcastic advertisements are mostly seen for cola drinks. 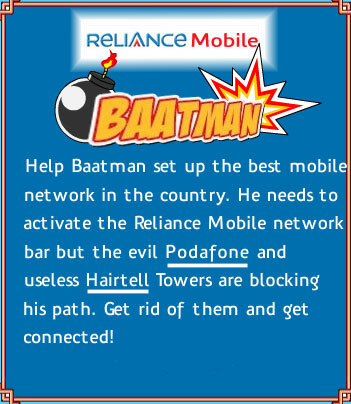 But now its not restricted to colas as Reliance brings sarcasm to the telecom sector. Check out the game known as Baatman which is on Reliance ADAG’s Zapak gaming website. The game is a remake of classic Bomberman and is obviously created to market Reliance Mobile which touts itself as the best mobile network in the country. If self-boasting is not enough, they also take a dig at its competitors called as Podafone (evil) and Hairtell (useless). So if you haven’t figured it out yet, they are referring to Vodafone and Airtel. We have already read, heard and seen much about Hutch becoming Vodafone. The whole rebranding exercise was one of the biggest in India considering the amount which was put into the whole effort. The cost sums up to a whopping Rs. 200 Crore which was used in all sorts of communication activities to make people aware that Hutch is now Vodafone. The company needs to be saluted for a great feat it achieved a day prior to the launch. If you ever noticed, the ads were aired the previous night and simultaneously at the same time all Hutch banners, signages at the dealers, small shops were being replaced by the new Red ones. This was not a small thing as the operator had to change about three and a half crore signages all across the country and replace them with new ones, so that when you get out of your house the next morning you no longer see even a trace of the name Hutch anywhere. It successfully managed to rebrand and revamp its 370 Hutch shops and a few lakh dealerships. Considering the massive cost involved, such efficiency would be expected and the operator was successful in the feat. Tata Teleservices claims to be the fastest growing telecom service provider in India. You would be doubtful about this statement, but it’s completely true. Tata Indicom is all set to give the biggies in the industry a run for their share of the cake. The most recent blow is the result of the market study made by market research agency Synovate. It marks Tata in numero uno position in terms of Brand Recall, Awareness and Reach. The Hutch is now Vodafone campaign was successfully launched last night, with the ad being aired at the best possible time. Yes I am talking about the exciting match between India and South Africa. The company used the match to it’s advantage and the ads were rolled out. Thus we would like to welcome the Red and White Giant to India and wish it luck. As for the ad, Vodafone has managed to have continuity in the campaign by having the Hutch dog and the animated couple in its ads. This helps customers relate to Hutch and the transition in the ad does the rest. The transition of the brand is depicted in the best manner by showing the Hutch dog, moving out of his old Pink kennel and moving to his new Red Kennel, followed by text which reads “Change is Good”. The ad campaign has managed to capture attention and thus convey the message across to the masses. The ad is being aired extensively to bring better effectiveness and awareness. And yea, so from now on all the Hutch news will be posted in a new category known as Vodafone. Watch one more ad after the break. BPL the Mumbai based operator being managed by the Essar Group has just undergone a makeover; by breaking out of its blue and red “live wirefree” shell and adapting a multi-colored look to the brand. The new look aims at attracting the youth and adds new life to the brand. The new brand campaign named Get in the Loop having a fresh feel to it seems to be working quite well. But the success totally depends on how many of these targeted guys and gals actually opt for the service and get into the loop.Now to add some more gyaan, we did something we are good at. What else, give our two cents on their website.